Create Embellish Adore: Its MY BIRTHDAY BLISS! I have to admit I got "celebrated out" from Dr. Suess's birthday growing up, so it kinda lost its flair for a while. Though many friends wishing me endless birthday wishes have helped me greatly overcome this, I still feel like with all the 'other' birthdays on this day - I do not celebrate ME enough. So, with that being said, not only am I celebrating ME today, I am taking ALL week and doing it. Now I do not get any fancy vacation- or wild parties, but I am making some birthday goodies all week long! 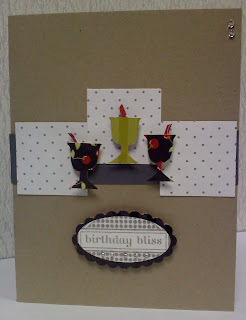 Todays card - Simple Birthday Bliss! Using Birthday Bliss, from the SU! set, Birthday Bliss, which you can get FREE with a $50! purchase until the end of March! I used the large oval punch and scallop oval punches for the sentiment. I added some rhinestones to the sentiment oval and on the top corner of the card. 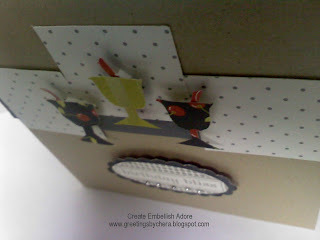 I used the Tab punch to make the cups.. .you can do - just check out your scraps! I used the Square punch for the Rockabilly DSP squares. Of course the Rockabilly DSP is retired but its still a big favorite of mine. The cups are on dimensionals! Dr. Suess (Duh! ), Jon Bon Jovi (musican), Yahoo (15 years!! ), Daniel Craig (actor), Luke Pritchard (the Kooks), Ben Roethlisberger (Steelers), Desi Arnaz (actor), Chris Martin (Coldplay), Cory Zellers & my loveliest aunt Carol Negley (Lakeland, FL) & ME!!!!! I hope your special day is full of sweet surprises, family and friends! I also love your card!!! What a great idea using the tab punch for your cups!!! Totally awesome! Have a super great birthday!!! May your day be filled with great things!!! Congratulations Chera! Love the card you made! Happy Birthday to you and me! I completely understand what you mean about Dr. Suess. I even used to live in Lakeland FL (like your aunt) back in the late 70's. I have had a fantastic day so far and hope you have too. HAPPY BIRTHDAY!!! You should celebrate for all it's worth, and consider yourself in very good company! Happy, Happy, Happy Birthday! Hope you had a great day! Today is also my sister-in-law, Linda's (Watauga, TX) birthday.